Did it ever happen to you that one person changed your life? Did you ever have a wow day without expecting it at all? I want to tell you a story, which took place almost half a year ago. In March 2014, on the Serbian National Conference, president of AIESEC in Serbia at the time — Aleksa Nikolic held a speech. It was his last speech as the president, since he was leaving very soon to a new position in AIESEC International. For those who don’t know, AIESEC changes its leadership body completely every year to provide opportunity for life-changing experiences to more people. Anyway, Aleksa grew during the year he was a president, developed a lot personally and professionally and changed the organization. That day, he shared stories with us, laughed, appreciated his team and played one video. I don’t remember exactly the story that led to him playing the video. Our memory is tricky and we remember flashes, feelings and images. But he played this video. Have you seen it? If not, take a minute now to see it and then continue reading; you won’t regret it. Maybe the message of the poem is not something you haven’t heard before or maybe it is. Maybe you heard a completely different message than I did that day. That’s the beauty of poems. Each person finds something in it for himself or herself. Carpe diem. Live as if you’ll die today. Live every single day to the fullest because time flies. Live for something. Live in peace. Maybe you see messages as the same or carrying similar meaning. Maybe they’ve lost meaning to you because you’ve heard them so many times. But sometimes by changing the package, you get to see the same thing in a completely different light. This is what happened to me that day. Realize our reflection is the first sentence to a story. We always consider leadership and changing the world as a massive undertaking. But sometimes it’s about changing one life. That day, with a simple message, Aleksa changed mine. But there were more than 200 people in that room. Maybe he changed a couple more without even realising. Sometimes small changes produce big echoes. So think of things that inspire you and think about giving back and sharing with others selflessly. Because we live in such a world today where it’s easy to become self-centered and easy to forget whom else we are in this world with. And you never know whom you can inspire by accident. So lets teach each other and inspire each other. Because leadership is about people. And this world is about people. How many lives you think you changed without even realising it? Maybe that is how you contributed to building a more peaceful world. AIESEC Everyday Leader Series — Everyday Leaders Changing the World. Submit Your Story! World Peace may just be attainable. AIESEC Everyday Leader Series — Everyday Leaders Changing the World. AIESEC Everyday Leader series highlights powerful stories and lessons from thought and everyday leaders from around the world. The stories illustrate on how World Peace may just be attainable through the actions of everyday leaders who are working towards the peace and fulfilment of humankind’s potential. How can you participate and contribute your inspiring story for Everyday Leadership? Know somebody that inspires you? Share this page with them. Are you an AIESEC alumni? We’d love to hear your story too. We will review your story, and contact you for re-publication on our global blog and global social media channels. Stories will be pre-approved before publication, and are subject to editorial modifications to align with the central theme. Not all stories will be accepted for global showcasing, but we encourage you to share your own story with those around you. One or more clear high-quality impactful photo (we encourage videos too). Connected to how everyday leaders can change the world and its connection to AIESEC’s mission of peace and fulfilment of humankind’s potential. Has a blurb at the end of the article written: “This story was written in contribution to the AIESEC Everyday Leader Series, that showcases stories of everyday leaders who are changing the world. Share your story with the world. This is not a story about current conflicts that are happening in the world. It is not about rockets flying over our skies or ending wars. It is about smaller things. Little things. But the kind of little things that keep a person going forward; that bring the spark into everyday and strengthen the belief that this world is worth fighting for. In a small town in Hungary named Gyor, 50 young people from AIESEC in Austria attended a conference to plan for the upcoming year and cover numerous topics relevant for the executive bodies gathered there. This conference itself is special because it brings together young people from 6 different countries: Hungary, Slovakia, Czech Republic, Austria, Serbia and Brazil. But that is another story altogether. 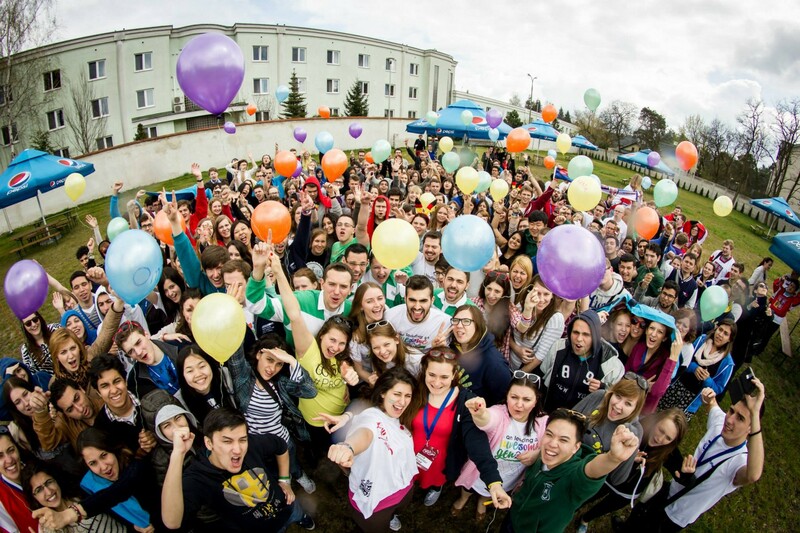 AIESEC Central European Congress gathering young people from Hungary, Slovakia, Czech Republic and Austria. The moment that matters happened towards the end of the conference. I was holding a session — last session of the day about external exposure (since I am Head of PR and Marketing). I was very skeptical of how it would go because everyone was tired from the six-day conference, which was almost over. There was a part of the session that I completely forgot about; this small task which turned out to be the spark of greatness. I remember I almost skipped it. You never know what is going to be the biggest moment of the day. Usually the moments you believe will be insignificant turn out to be big ones. After a couple of minutes, it was a moment to share. I thought a couple of people would share and that’s it. It started with a few remarks and turned into fiery exchange of ideas and opinions. Forty young people in leadership positions voiced their opinion, passionate about making a change in their hometowns and their country — from educational gap between formal and informal education and skills and experience required to find a job today, to racism in the world and Austria and how to tackle the integration of immigrants for a more peaceful and tolerant world. The issue of aging population and how to empower youth to ensure a sustainable development. Women leadership today in the world and in AIESEC (which is abundant with women in leadership positions). Internationality and positive aspects of it in today’s globalized world, where conflicts seem to appear like fireworks. Start-ups and the concept of entrepreneurship and innovation as solutions for challenges facing the world today. Tackling social challenges and addressing those that are relevant in a country. And many more. At least 20 people were actively sharing and feeding of each other’s ideas. I was standing on the stage, listening to one person after another saying their opinions, listing topics they are passionate about and they would like to write about. I remember I didn’t want the exchange of ideas to stop. I was so overwhelmed by the passion about the issues mentioned and flabbergasted by a wide variety of interests. Forty young minds awake and aware of things that don’t work and willing to do something about it. Have you ever witnessed something like that? I remember that when my enthusiasm and disbelief settled, I was angry — at people saying that youth today is passive; that we don’t care about anything but ourselves. I remember standing in the room with 50 people who paid to come to a six-day conference when they could have gone to the seaside like their friends did. I remember them talking at 7pm in the evening about issues in the world and at home they were passionate about and wanted to solve. And I remember one thought above all others. That there is greatness in young people. They are aware of the world they live in — technology has made us interconnected and informed. They are passionate and they have an opinion. They are ready to be heard and to contribute to changes if the world will let them. So how can we empower them? How can we make sure they get a say in what kind of world is being built for them? What kind of world they will live in? Maybe you’re thinking now that we’re young and that we’ve got a lot to learn yet. And this is true. We don’t know everything. But we have ideas and we are ready to learn. And we’re worth it. So it should begin today, because 5 to 10 years from now, some of those forty people will have leadership or executive positions. They will have the opportunity to decide which course we take, for better or worse. Imagine if everyone thought like that. Imagine if everyone cared. Imagine if the world was made up of this type of young people — interested, aware, concerned and willing to participate and change the world for the better. Imagine the world they would be able to build. And help them — help us build it. This story was written in contribution to the AIESEC Everyday Leader Series, which showcases stories of everyday leaders who are changing the world. Share your story with the world. Are You Multitasking Your Brilliance Away? Projects, meetings, emails, notifications, social media, a million tabs on your internet browser, the disruptions go on. Is multitasking harming your ability to work effectively? If often takes a reminder on why it is so important to focus. Our desires for accessibility lead to an inability to access anything. Why does our brain feel overloaded as we drown ourselves in multiple tasks? This is a result of chronic multitasking, and it isn’t healthy for your productivity, health or quality of work. An article on Time quoted a 2010 study by neuroscientists at the French medical research agency Inserm that showed that when people focus on two tasks simultaneously, each side of the brain tackles a different task. If our limits are two-tasks at once, anymore we will most likely make errors. Nass recommends a 20-minute rule. Instead of switching tasks minute to minute, allocate yourself to 20-minute chunks to a singular task, focus, and then move on. Here’s a little humour, but also practical solution to multitasking, monotasking. The picture below shows what happened to Paolo Cardini’s barbeque on his 3 minute TED talk when he was multitasking while barbequeing. Similar to what happens to us when we “multitask” while trying to do something, we burn away our quality of work. Re-think how you approach your work by focusing one singular task and providing high-quality attention to your work, as opposed to spreading yourself thin, and get nothing done. Time is our most precious resource. Don’t multi-task your brilliance away, because imagine how much time, effort and productivity you lose simply because of a lack of focus. Sit down, open one tab, and get it done. What are your best-case practices for focusing? I’d love to hear them and share it. Tweet me at @gdondon and comment below. AIESEC World Peace series highlights the stories and lessons from thought and everyday leaders from around the world on how World Peace may just be attainable. Contribute your story. Leaders like Ahtisaari are not super heroes, but human beings just like you and I who have strived to achieve extraordinary accomplishments. They are everyday leaderswho care about the world and take action to defend human rights. The peaceful freedom fighter Aung San Suu Kyi was once faced at gunpoint, but she did not give in. Instead, she demonstrated absolute courage and clarity by walking without fear to the line of soldiers and with the guns pointed at her, and walked passed it. Nobody was killed. What would you have done in this moment? Pushing for world peace does not mean we all need to be walking in front of guns, but to take action even in the smallest ways. It is as practical as dedicating even a few hours a month volunteering for a cause that improves the lives of others, and yourself. These everyday actions, make a significant difference because you are now actively participating in your community. Jody Williams, Nobel Peace Prize Winner in 1997 for her work toward the banning and clearing of anti-personnel mines advocates for society to have a more realistic vision of world peace. The talk focuses on rethinking world peace to human security, and enabling people to live dignified lives. Julia Bacha a filmmaker who produced Budhrus discusses the power of attention, and how we often media and audiences pay attention to the violence, but not the non-violent leaders and peacemakers of the Middle East region that may very well bring peace to the region. Bacha advocates for us to pay attention to nonviolence. Progress will come, when all of humanity is awakened, moved to take action and not idly sit by to wait for change. Young people around the world need to strive to become an everyday leaders and make positive change happen by taking actions that improve the lives of others. How will you get involved in the global community and create positive change?